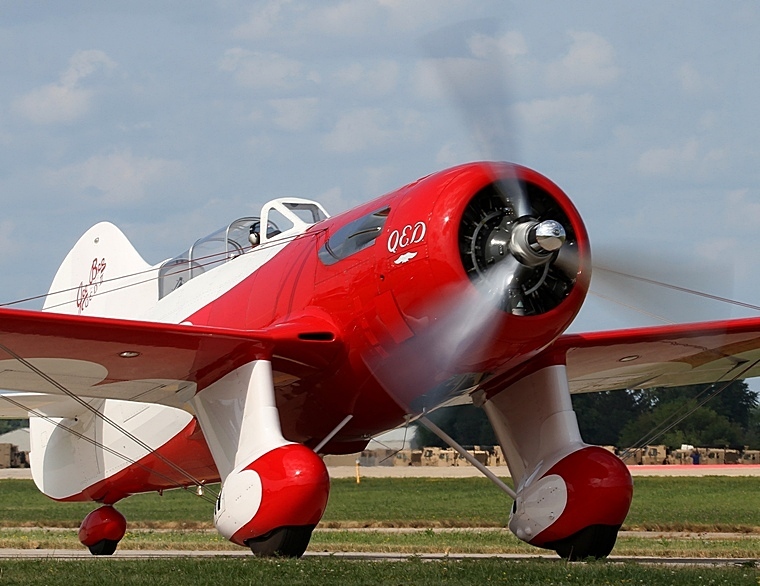 During the 1930s, the Granville brothers were famous for their racing aircraft that competed successfully all over the United States of America (USA.) 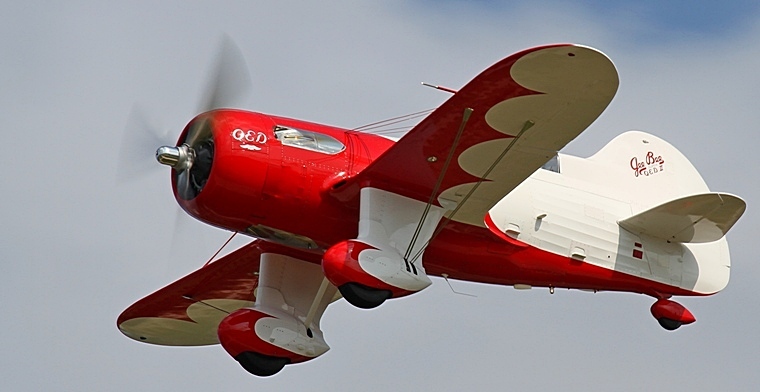 The Gee Bee Q.E.D. 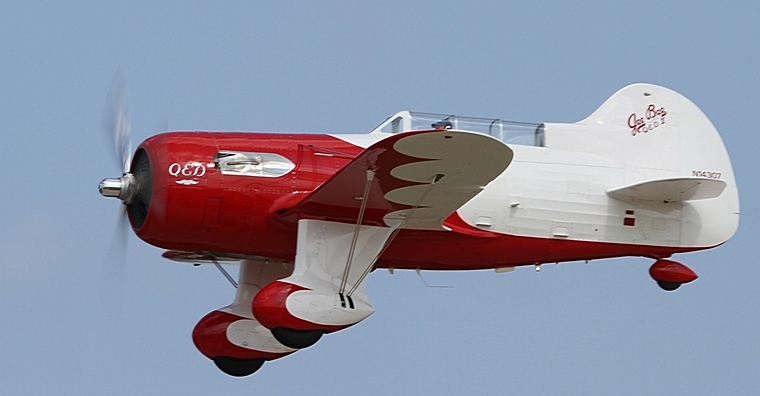 was a development of their successful R-5, but unlike their other designs was intended as a long distance racer to compete in the MacRobertson Air Race that started from RAF Mildenhall in East Anglia, England and finished at Flemington Racecourse, Melbourne, Australia. The QED had a rather shaky start. 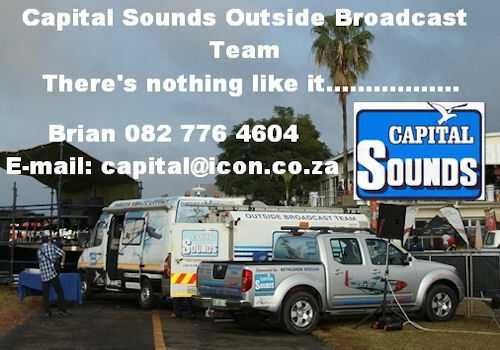 Development started early in 1933, but by October of that year the brothers were in financial difficulty and their company was soon placed in liquidation. Just when it seemed that the QED would end up forgotten in the corner of a derelict hangar, Granny Granville 'passed away' and left the brothers her prized possession - an immaculate Sportster E car, which they sold and used the funds to form a new company based in New York called Granville, Miller & De Lackner. 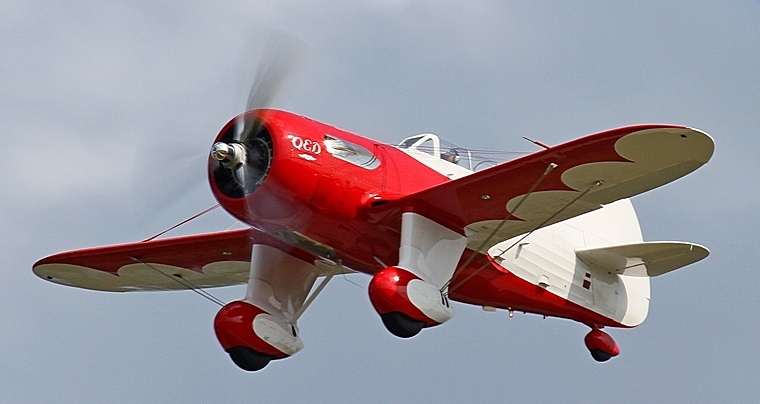 The QED was saved and early in 1934 it was ready to fly. Floyd B. Odlum became the first owner and the QED was entered in the Bendix Race in the same year. Piloted by Lee Gehlbach she dropped out en route to Iowa when the cowling came loose and hit the prop. She did not do much better in the MacRobertson Air Race. Flown by Jacqueline Cochran and Wesley Smith they withdrew after landing damage in Bucharest. In 1935, her woes continued when Royle Leonard was forced down with engine trouble whilst competing in the Bendix Race held in Kansas. In 1936, Lee Miles dropped out after ten laps of the Thompson Trophy Race held in Arizona and the QED was placed in storage. 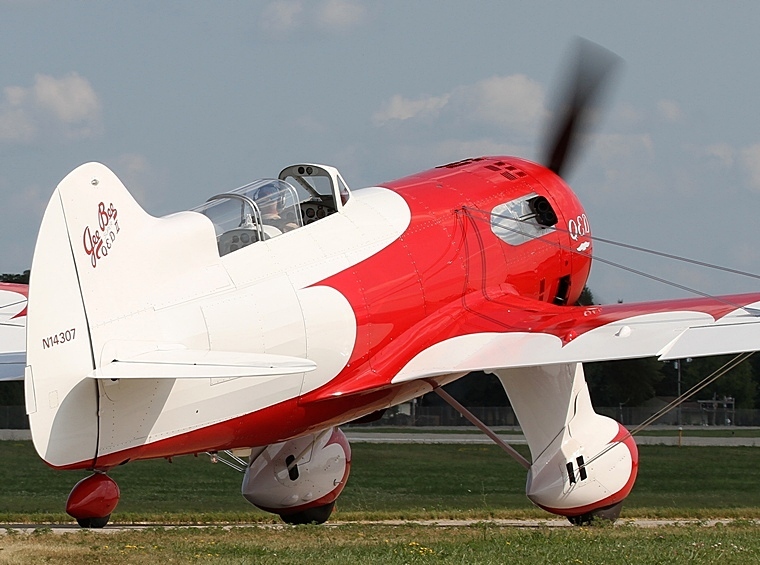 In 1938, she was brought out of storage, painted cream and competed in her third Bendix Race flown by George Armisted. Again, she did not finish. In 1939, she found herself in Mexico, owned by Francisco Sarabia, a well-known and much loved Mexican business man. Her fortunes improved. Sarabia set a new record of 10 hours 47 minutes for a non-stop flight between Mexico City and New York City. Sarabia continued setting records for flights between Los Angeles and Mexico City, Mexico to Merida and Mexico to Guatemala. Sadly, in late 1939, Sarabia was killed when a rag was ingested into the carburettor and the airplane crashed into the Potomac River. The QED was recovered fairly intact and transported to Mexico City where she was restored for static display in the Museum Francisco Sarabia. The original QED was similar in shape as the R-5 on which she was based. However, the QED was a much larger aircraft being almost 10 feet (3 metres) larger in length and span. Powered by a 675 hp (503 kW) Pratt & Whitney R-1690 Hornet Radial the fuselage was of steel tube with fabric covering whilst the wings were constructed of wood with mahogany plywood covering. 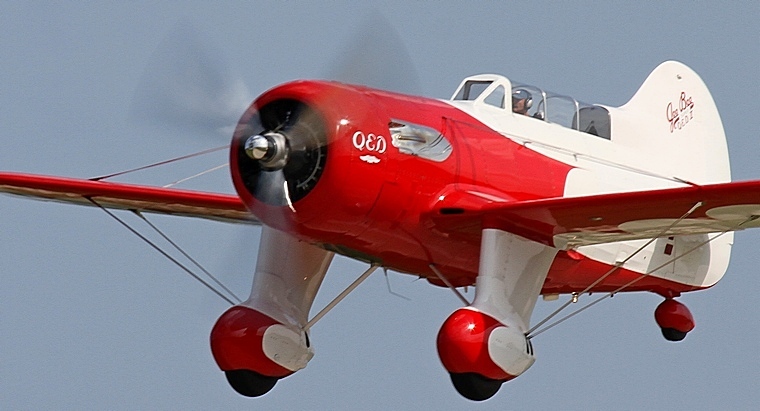 For decades, the only example of the QED was the one in the Sarabia Museum in Mexico, until Jim Moss, born 1931, a prolific replica builder/restorer of 1930s racing aircraft, decided to build one. No plans existed and he had to rely on photos taken of the original, until a fire ravaged the museum and damaged the QED. She was moved for restoration giving Jim the chance to take accurate measurements and detail drawings were made. Although sharing the overall dimensions of the original, Jim's replica the QED II, had a number of changes. Hung at the front end is a Wright R-1280 Cyclone that at 1,425 hp (1,063 kW) produces more than twice as much horsepower as the original's Pratt & Whitney R-1690 Hornet Radial. Balancing all that power up front is an enlarged fin and rudder area. To compensate for the extra 200lbs that the Cyclone weighs, fuel capacity was halved from 480 to 240 gallons. The QED is not a small aircraft. Its barrel shaped fuselage stands high on the front faired landing gear and wheels. The large fin curves almost immediately upwards from the narrow tandem canopy that starts almost at the edge of the mid-mounted wings. The QED II exudes a sense of brute power. It looks mean without being menacing. One cannot help, but stop, stare and marvel at her beauty. Standing next to a Pitts Special the QED ll will dwarf it. At 2.9 metres it is almost two metres higher and almost three metres longer and its wingspan of 10.44 metres exceeds that of the little bi-plane by almost four metres. At 1426 kg it is almost twice as heavy as Curtiss Pitts' invention. By the time QED II was nearing completion, Jim Moss was already in his 80s and suffering from cancer. He saw the first taxi runs of his labour of love, but sadly passed away on 1 September 2013 less than a month before the QED II took to the sky with Carter Teeters at the controls. Rich Allredge, who had assisted Jim when he became too ill to continue, took over as the project leader, said after the first flight: "She handled absolutely flawlessly. She took off at about 85-90 knots with a landing speed of around 95 knots. There were no surprises." He also confirmed that the team of builders would take the QED II to Oshkosh 2014 in memory of Jim Moss and it kept its promise. 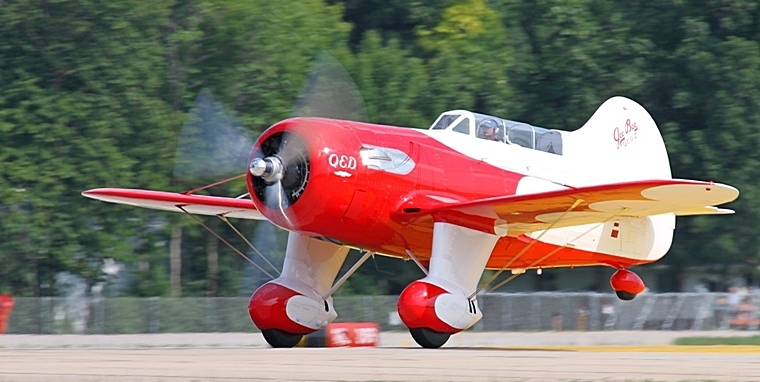 The QED in the Gee Bee's name is an abbreviation of the Latin 'quod erat demonstrandum' that translates to 'which had to be demonstrated' and the crowds at Oshkosh flocked to see one man's dream, passion and dedication demonstrated.